I tried Lola tampons, and told some friends that I'd let them know how I liked them, so... here we go! First of all, shipping was free! The packaging is great, just what you'd want for a subscription box of tampons: a plain brown box. 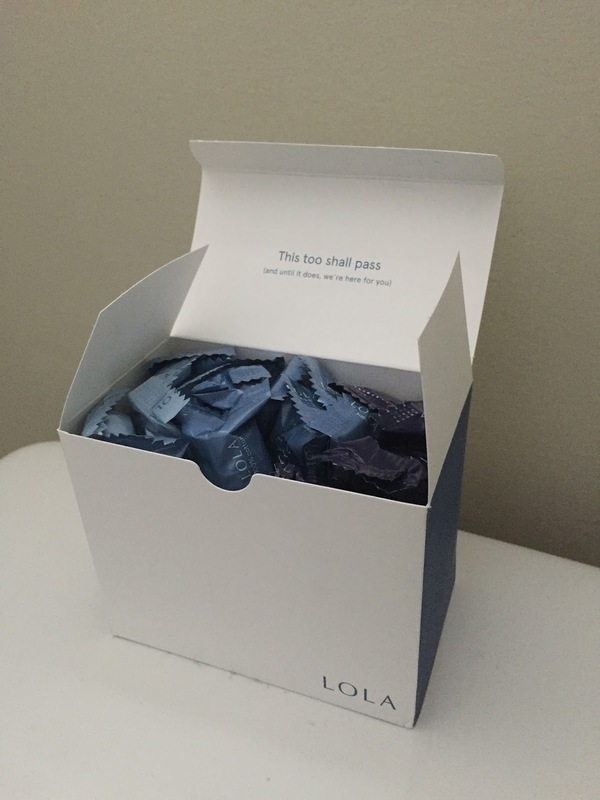 The individual boxes themselves are plain white, with the word Lola on the side. That's it. No hot pink nonsense or pictures of women playing volleyball or whatever. So, these are tampons. Not a whole lot to observe here, but there are some differences to point out between Lola and other major brands. 1. Lola tampons are 100% cotton. They feel like... cotton. Soft, and also a little fuzzy, with no "coating" them. In the interest of full disclosure, here's what's in Tampax: http://tampax.com/en-us/tips-and-advice/period-health/whats-in-a-tampax-tampon. 2. They're a little wider. Not longer thankfully, but bigger around. Enough that I noticed, but not uncomfortably so. 3. Plastic applicators. I personally prefer them to cardboard, but they're not exactly environmentally friendly here, so worth a mention. Also, they are pocket-friendly kind that you pull up to a click and then use as normal. 2. The lack of a coating (the "thin fabric around the absorbent core" on other tampons) does affect insertion and removal, but I didn't find it to be uncomfortable. 3. Absorbency seems to be on par with the major brands. I ordered 4 regular, 10 super, and 4 super+ in each box. I wanted to try these because after having two kids, my periods are unpredictable... some months it's what I'd call "normal," and sometimes it's a mess and I'm an unprepared teenager all over again... so it's great to be able to customize each box to whatever you need. You get 18 to work with and each month can be a different mix if you want! UPDATE: The absolute BEST part is that after three months my cramps are basically GONE. I wouldn't have believed that organic cotton would make that big of a difference, but I experienced it for myself! I still feel a little crampy, but nothing like the freaking giving-birth-contractions I used to get. I seriously couldn’t be happier! Get $5 off your order when you use my sign up code spanza1 at https://goo.gl/KT223F New customers get 2 boxes for the price of 1, or 3 boxes for the price of 2.